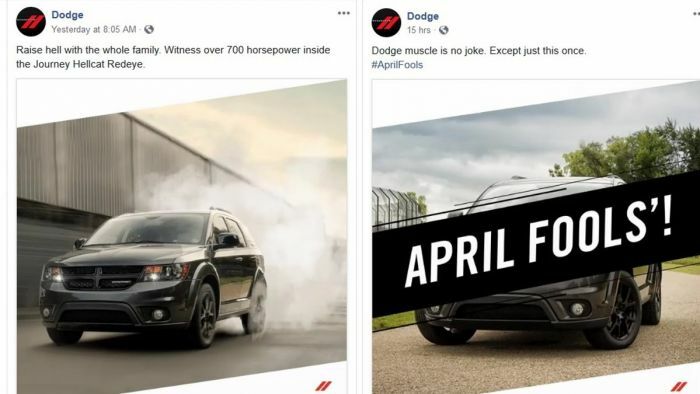 Rear-drive Dodge Journey powered by a Hellcat Redeye engine was posted to Facebook, but it was an April Fool’s Day joke. Yesterday morning, the official Dodge Facebook page shared the picture above on the left, showing what was supposedly a Journey with the Hellcat Redeye Hemi smoking the rear tires. Even though the image was posted on April Fool’s Day, a day when there is even more bad information posted to social media, many people believed that the Dodge Journey Hellcat Redeye was a real thing. Fortunately, the automaker’s Facebook page posted a second picture (above on the right) last night confirming that the Hellcat Journey was nothing more than a joke. “I saw it on the official Dodge Facebook page, so it has to be a real thing!” That was the battle cry of the folks who had been fooled, even when people who got the joke tried to point out that a rear-wheel-drive Dodge Journey with the Challenger’s Redeye Hemi was very unlikely – especially on April Fool’s Day. However, the easily-fooled stuck to their guns, insisting that the midsized crossover would soon have more than 700 horsepower. After all, Dodge shared the information and there was even a GIF of the rear-drive crossover roasting the tires, so it had to be real. Dodge was that cool, they claimed, to make something as ridiculous as a 797-horsepower Hellcat Journey. The Dodge brand has made some moves in the past five years that many people called crazy, such as killing off small cars, transitioning away from their popular minivan and introducing muscle cars with 707, 717, 797 and 840 horsepower. Of course, other automakers followed suit with the small cars and the Chrysler Pacifica has picked up the minivan slack, while the high performance muscle cars have sold in numbers that have far-exceeded optimistic internal estimates. Sadly, a rear-wheel-drive, midsized crossover with a Hellcat Redeye Hemi is too crazy to exist in the modern market, but more importantly, it is probably mechanically impossible for such a vehicle to exist without massive changes to the entire vehicle. Although Dodge confirmed last night that the Hellcat Redeye Journey is not a real thing, we can explain why it would be impossible to bring to market. The Dodge Journey is a front-wheel-drive, unibody crossover, powered by a 3.6-liter Pentastar V6 with 283 horsepower and 260 lb-ft of torque. Installing a huge, supercharged Hemi would require ripping out the stock drivetrain, but the Hellcat Hemi may not fit in the stock engine bay. The transmission, driveshaft and rear differential would not fit either, so the entire floor would have to be hacked up to make room for the rear-drive bits; enlarging the engine bay is just another drop in the bucket. Even after you modified the engine bay, and floor under the seats and the area where the rear differential would sit and got everything bolted into place, the power of the Hellcat Hemi would do horrible things to the crossover chassis. It would likely twist the Journey in half, so the build team would need to install significant chassis reinforcements. The result of all of this work would be a very expensive Dodge Journey, and that is before the company got into crash testing (required with all of the chassis changes) and emission testing. A vehicle that few people would consider would end up costing more than the Jeep Grand Cherokee Trackhawk, so in addition to being a ton of work for the company, there would be very little market – likely making this a sure-fire money-loser. In any case, there is no Dodge Journey SRT Hellcat Redeye on the way.